ATTENTION: TAJ-MAT-7428-PP PRO-PLUS (PEMF) InfraMat Pro is for professional use only. SPA, Medical office, Therapeutic centers. Please send us your business verification before purchase. The medium size mat can comfortably fit on any area of the body, promoting general wellness and overall health. This mat contains pounds of healing stones to further increase the general wellness experienced by the user. The stones in this mat are amethysts, tourmaline and jade. Each stone has healing properties for both the mind and the body. 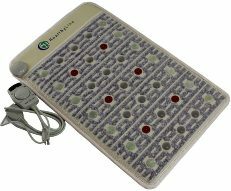 By combining the unique healing properties of all stones with the heat from the InfraMat Pro, the body experiences relaxing health improvement and a radically extraordinary detoxification.